Monsoon Watch -8 (Periodical Progress and Current Status). Much has happened after the last Monsoon Watch put up on Vagaries. MW-7 pushed the Monsoon into Maldives and Andamans. All through this year's previous MWs articles, we have been mentioning, and explaining that the Arabian Sea sector of the Monsoon has been weak, and lagging. It was either a weak cross equtorial flow or a weak Somali effect or not enough momentumin the Arabian Sea due to low SSTs. While, the Bay branch, has been normal and was always on schedule. We saw the SWM advance into the Bay Islands almost on schedule by the 19th of May. Progressed well, though a little behind date into the Andaman Sea and had covered the Islands by the 25th of May. The Arabian Sea branch covered the Maldives around the 25th/26th of May. The Bay current and momentum was kept active by strong cross flows from the South, and with a pulse from the Thai mainland, the SWM moved into the NE states by the 3rd of June. Cherrapunji announced the arrival with 400 mms of rain in a day ! The Arabian Branch had always been without proper support and energy. All the supporting factors here were lagging, and "letting down" the SWM. Still. a weak and lame SWM crept into Kerala, and the Indian mainland was hit on 5th June. The off shore trough here along the west coast responded fast, and its formation led to the advance along the coast into coastal Karnatak and Goa by the 6th of June, and into South Konkan by the 10th. Interior Karnataka and TN did not get the required benefits of Monsoon rains as the sole initator of the SWM advance along the west coast was a "lame" trough. But, all the other parameters for Monsoon advance like OLR, Upper Winds, UTH and 200 hp jet streams were favourable in S.I.Karnataka and TN, but without proper precipitation. Vagaries had moved in the SWM in these regions on 10th due to these factors. IMD has moved the SWM in on the 13th. For the Eastern sector, the sector which gets the SWM from the Bay, resistance came from 3 WDs, J1,J2 and now J3. The back to back WDs in June kept the pulses and any system from the Bay from forming in the Northern Bay areas, and prevented any form of Monsoon advance moving into the mainland all along from TN to the NE states. 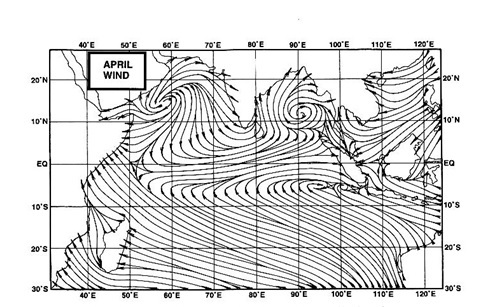 The Eastwards moving WDs pulled the seasonal low into an elongated low across the plains of N.India. In early June, the first 10/11 days of June, we see a long elongated region of 998 mb low stretching from around Delhi to Bihar. This is in effect a similar condition to a "break monsoon" situation. Though not actually a break monsoon scene, as the Monsoon has halted advance well South of the Peninsula. The actual area under Monsoon as on 13th is very small and comparatively much less than normal coverage. For Chennai, Strong Westerly winds prevented and blocked the East sea breeze from setting in last 2/3 days, and resulted in the days shooting up again to 40c and above. Due to lack of cooler and moist air, prevented from flowing in land, Orissa, Chattisgarh and Coastal AP bore the brunt of a severe heat wave, which broke several all time records. In fact it was one of the longest lasting heat waves in terms of days in Orissa. Bhubaneshwar broke its all time high record. Vagaries has been mentioning these high temperatures in its daily blogs. Meanwhile, a "brave' vortex maneged to creep into Coastal AP yesterday (Tuesday,12th June), and bring some relief rains along the coastal regions. Tuni and Vizag recieved 24 mms. Other hotspots like Vijaywada and Narsapur were lucky to get some soothing showers. Between the 10th and the 13th of June, there was a favourable "chance" for the Monsoon to move into North Konkan due to the formation of a UAC in the off shore trough. An ideal influencing factor for monsoon advance. The UAC was critically located just off the Mumbai coast. But the clouding associated with the system was restricted to the SW of the system. By the 13th, the UAC, though still present, has moved NW, and tilted the Northern end of the trough away from the coast, westwards. Resultantly, instead of Konkan, we see heavy thundershowers in Saurastra, parts of Kutch and Eastern Gujarat on Wednesday. Heavy rainfall ranging from 15 mms - 70 mms are reported fom Gujarat. Askokbhai mentions Rajkot getting 44 mms in 90 minutes on Wednesday afternoon, with maximum rain rate around 3.30pm at 150 mms/hour ! Thundershowers will linger around for another day due to superb moisture incursion. Bharuch and Baroda regions to get maximum rains on Thursday. This UAC in the Arabian Sea is expected to persist for a day more, but more towards the west. On dissolving, we may have the off shore trough shifting back near the west coast again. The revival of the monsoon gets another chance, if/when the trough moves towards the coast, and hosts another UAC within. Synoptic situation indicates formation of an embedded low by Saturday, 16th/Sunday, 17th. But, even this factor is cosmetic. It will move up the SWM along the coast, but the interiors of Mah region will devoid of monsoon rains till a proper low emerges from the Bay. With the Bay clear of any resistance (from WDs), it should getting active from Sunday, 17th June, onwards. A pulse/UAC can travel into AP and move towards Vid and adjoining Mah areas. Possibility of Monsoon advance into Vid and Chattisgarh regions and East MP by the 20th of June. Simultaniously, monsoon rains will move westwards from the Bay into W Bengal (Kolkata) and remaining Bangladesh. A weak MJO phase enters our seas from 15th June, and could prevail till 27th June at least. The 30 day SOI value is also not very favourable at -7.8. Hence, Monsoon remains overall weak in June even after advance. Interior Peninsula, NW India may see a June deficit, alongwith some regions of East MP, Rajasthan and Southern Interior Peninsula. Presently, the ENSO condition is neutral. Many international models forecast the El-Nino to develop by September. I would not currently worry about the El-Nino for our Monsoon. Let us be more concerned with the current weak MJO phase, which might push the SWM into a "break" phase immiedietly on setting in ! June rainfall can still reach around 550 mms. Friday, 15th: Thunderclouds forming could precipitate rains in some parts of the city. expect the odd heavy shower somewhere. Rain amount 10 mms. Saturday, 16th: Increasing cloudiness and a few showers and thunder shower by evening. Rain Amount 15-20 mms. Monsoon could advance into Mumbai by Sunday, 17th. @Rajesh, Eagerly Waiting for your next monsoon watch. What is the current state of ENSO and how it will be for the monsoon period? I hope there is no El Nino. After last week's soothing rains, the temperature is back to low forties here in Delhi. considering your blog audience is varied, i request you to publish concise and detailed version. Please Rajesh sir give detailed explanation.Because of your detailed explanation I have gained lot of knowledge about meterology. Seems again Gujarat/Rajisthan are likely to hit target, dense clouds giving rain to Gujarat - monsoon ahead of time. Last 5 years Gujarat/Rajisthan receiving more/excess rains. Next low over Arabian sea may move north and again bring bountiful rains to Guj/Raj/Mah? What is happening to south interior peninsula? Absolutely no rain. Forcast of rain to interiors and AP is null. Hi Rajesh. All elements of a non-linear chaotic system of weather are there to see. The IOD turned positive from negative two months ago. Most models have to eat their words. The El Nino international models from predicting very probable, now says 50-50 most probably ENSO neutral! Here too, there is a climb down. With a negative PDO and post 2 year La Nina, it maybe too much to expect a strong El Nino, in fact any El Nino at all. It may need another two weeks for a confirmation where ENSO is heading. So that leaves the MJO as you rightly concluded as the wild card.My knowledge of MJO's impact on monsoon is poor. What I learnt from you is that it moderates the breaks. When does the MJO expected to flip back? Despite the poor start, I still maintain a normal 99-104 LPA forecast. Plan to review in two weeks time. I agree with what Rajan Alexander said and MJO forecasts looks very scary. All MJO models forecast dry phase of MJO till first week of July. And it looks damm bleak even for monsoon bounty states such as Maharashtra, Karnataka and Kerala They will also get below normal rainfall in june. And May be deficient too. So lets all wait till Super July where bountiful monsoon rains are expected. of monsoon monsoon after 17 June may be true, but it will be weak monsoon wave. And Mumbai rainfall ....hmmm.... Rajesh....it will be hard for mumbai to get to 550 mm mark in june. Anything above 300-400 is bonus for mumbai in june. Ron: El-Nino may not worry us now..for the time being..but cant say about the MJO ..
RK: yes these high temps were expected again in Delhi..dont see relief soon..
wow..this is interesting..didn't know about these cloud patterns..Could you tell us more in brief pls rajesh sir?? sure ron/pavan: I'll write a short note on visual obseravtions (crude method as per todays std) tom. A huge cloud formation moving towards Mumbai. Will it rain tomorrow (Fri the 15th)?. A bleak situation as far as the Arabian Sea wing of SWM goes !! But I was hoping for a better start to the Bay wing considering the fact that last year too Bay did not really host many lows. Over all if you look at it tendency of things to move eastwards - Burma/ NEast. Even Pacific storms are veering North Eastwards. Praying this tendency gets arrested and tropical storms move westwards sending pulse into the Bay. If El-Nino sets in, we should be seeing series of storms in the China Sea. Am I right Rajesh ? Returning to West coast of the country, wondering why IMD has not rung the alarm bell !! BMC has start immediate water cuts in Mumbai. Heard from Kerala that Idukki Dam has just 10 days of water left. Overall Monsoon adding to the overall cynicism in the Nation. after a hiatus of 4 days monsoon clouds r back at panvel!!! !so rleived to see the grey low clouds coming from south west and spreading their magic!!! !i guess offshore trough must be realigning!!! Whether forecasted low pressure in NW BOB can give rainfall in Gujarat?